Synthetic peptide within Human cbx7 aa 150-250. The exact sequence is proprietary. 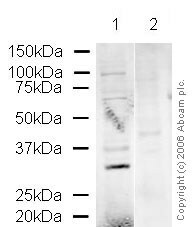 This antibody gave a positive signal in MEF1 whole cell lysate and HeLa nuclear extract. Our Abpromise guarantee covers the use of ab31765 in the following tested applications. WB Use a concentration of 1 µg/ml. Detects a band of approximately 30 kDa (predicted molecular weight: 28 kDa). Control of cell proliferation by Polycomb group proteins (PcG) is an important facet of cellular homeostasis and its disruption can promote tumorigenesis. CBX7 is a novel PcG protein which is found to control the growth of normal cells. CBX7 is a gene that encodes a Polycomb protein, as shown by sequence homology, its interaction with Ring1 and its localization to nuclear Polycomb bodies. CBX7 extends the lifespan of a wide range of normal human cells and immortalizes mouse fibroblasts by downregulating expression of the Ink4a/Arf locus. CBX7 does not inter-function or colocalize with Bmi1, and both can exert their actions independently of each other as shown by reverse genetics. CBX7 was highly expressed in three different prostate cancer cell lines and present at elevated levels in normal prostate. (Gil et al., 2004). A clear band at the expected size appears in lane 1. This band is specifically blocked by the immunizing peptide in lane 2. Publishing research using ab31765? Please let us know so that we can cite the reference in this datasheet. There are currently no Customer reviews or Questions for ab31765.